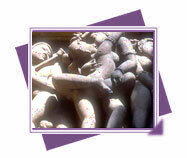 Khajuraho, once capital of the Chandela dynasty, is today recognized for its superb temples. The Archaeological Museum was established in 1922. On view are archaeological antiquities similar to sculpture, inscriptions, copper plates, inscribed seals, stone pillars and capitals, sati stones, metal images, terracotta and coins excavated from very old sites like Pawaya (Padmavati), Besvagar (Vidisha). Ujjain (Ujjayini) and Maheshwar. Like most site Museums in India, this one also owes its genesis to an English general accidentally stumbling upon some ancient ruins around 1818. In February 1982, a unique cultural complex called Bharat Bhavan opened in Bhopal. Built and designed by the well known architecture Charles Correa, the complex is set in a number of the number of low building set around the banks of the lake. The Central Museum, established in 1929, was conceived as a purely district institution. 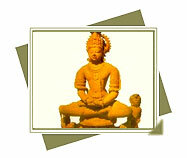 Consequently it displays antiquities from the western Malwa area of Madhya Pradesh. 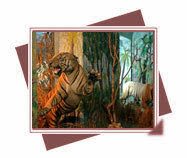 On sight are paintings, sculpture, bronzes, terracotta, coins and architectural relics. The Central Museum at Bhopal was recognized in 1949. On sight are paintings, coins, porcelain object, metal and ivory toys and artefact, woodcarvings and a number of miscellaneous items like needle-works and local handicrafts. Deogarh or Fort of the Gods and Chanderi Fort: These forts are on the either side of the Betwa River on the main route to the Deccan. The fortress palace at Datia is one of a superb architectural work. The fort is an exemplary mixture of the Rajput and Mughal architecture. The Four gateways make in 35 BC are the best from of Buddhist expression one can find any where in the world. Gateways or Torans as they are called are covered with explicit carving which depict scenes from the life Buddha and the the Jatakas, the stories relating to Buddha and his earlier births. 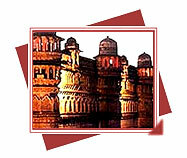 The Fort of Gwalior has slumbered for long in silence. Now every night, famous incidents are re-enacted in a sound and light show. The Sound and Light show at the Man Mandir Palace of Gwalior Fort gives you a glimpse into the glorious past. Jehan Numa Palace, nestled on the slopes of Shamla Hill, Bhopal, set in five acres of lush green grass, trees and splashes of colourful Bougainvilla, is a delightful and charming get-away. The Temples: The architectural way of the Khajuraho temples is extremely dissimilar from the temple prototype of that period. Each stands, instead of within the customary enclosure, on a high masonry platform. Lal Baag palace lies on the south-west of the city, bounded by gardens. It was built between 1886 and 1921. Currently this is the residence of Usha Raje, direct descendent of the Holkars, whose ancestral fort it used to be. 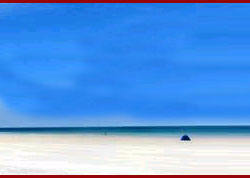 The land of Bastar is identified for the Chait Parah and the Dhankul songs. The previous is of the seasonal category while the latter is connected with the invocation to the goddess Danteshwari. Work on the Raja Mahal was started by Raja Rudra Pratap, but he died in 1531, leaving the construction incomplete. His son, Bharti Chand, completed the front and the main portion of the palace, but could not complete the building during his lifetime. Sanchi has been well-known for the Stupas which were built on the peak of a hill. The purpose of these stupas was mostly religious. The most likely use of the stupas has been said to keep the relics. As museum devoted to archeology, the State Museum exhibit antiquity like coins, sculptures, terracotta excavated from all the significant sites of the region. Also on the view are paintings and handicrafts, especially those made by the tribal communities of the Baster.